Black-Eyed Peas and Okra | JPMA, Inc. In a skillet, heat vegetable oil over medium heat. Add onion and garlic then cook until soft, about 5 minutes. 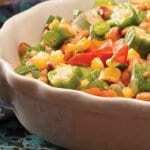 Add okra, corn, black-eyed peas, and chilies then cook until black-eyed peas are tender, about 20 minutes. Add green onion and cherry tomatoes, then cook an additional 5 minutes. Stir in salt and pepper.